When I did the original outline for this article I tried to think of an appealing title. Many trainees do no leg work at all, and those that do usually do not do enough. I thought an appealing title might entice some of them into including leg work in their training programs. I later decided that an honest evaluation of the pros and cons of leg work would be the best enticement. I won't try to deceive anyone; leg work done properly can really be tough. There are no easy leg exercises, and to be effective you really have to go all out. This is one factor against leg work. The fact that your legs are normally covered is the second factor. Most individuals prefer to work the muscles that are seen by everyone. Also, some leg exercises require a relatively heavy weight to be effective. Heavy poundages seem to create a mental barrier for some individuals. Combine all these factors and you can see why leg work could be ignored. Now let's take a look at some of the benefits derived from a good leg program. Your legs are your primary means of moving from one place to another. This alone should motivate you to keep them in good condition. Almost all forms of athletes require strong legs. If you are using weight training to improve athletic performance, three or four sets of squats will be a lot more beneficial than the same amount of barbell curls. For those who are interested in increased size, there is no greater stimulation of body growth than leg work. Your cardiovascular system benefits more from leg work than from any other exercise. Also, nothing looks funnier than a well developed upper body on a set of pencil thin legs. If you honestly evaluate the pluses and minuses it is difficult not to include a good leg program in your workout. I am not saying that you have to squat with World Record poundages or to develop your legs to the degree required to win a Mr. Universe contest. What I am saying is that an efficient leg program will go a long way in improving your physique and your health. The key to leg work is quality not quantity. This is one area where you really have to push out that extra rep. I have seem many individuals almost pass out in an effort to squeeze out one more rep in the bench press or curl. These same individuals quit when they still have four or five reps left in the squat. Part of the reason for this is that it is extremely difficult both physically and mentally to train the squat to failure. to do this requires guts and good spotters or safety devices. I do not advocate training to failure, but you should come close. We used to train with an individual who pushed so hard in the squat that he couldn't make his legs move when he finished his reps. We had to help him back to the racks. I personally feel the best exercise for the legs is the squat. I do not state this because I am a powerlifter. I have found from practical experience that my leg size will not increase without squatting. Set upon set of leg extensions and leg curls will not accomplish this. If at all possible, make squats the cornerstone of your leg program. I realize that some individuals physically cannot do squats, but there are too many trainees who claim they cannot do them, when in reality they just don't want to. Because you hurt your knee or injured your lower back three years ago doing squats should not prevent you from doing them today. How many times have we injured and elbow or shoulder benching? We don't that exercise aside. What I am trying to say is give leg work an honest effort. Like anything else, if you haven't done much leg work, start slow. Don't worry about the weight you use until you get accustomed to the exercise. You should strive for relatively high reps with a decent amount of weight, not singles or doubles with personal records. I recommend working your legs two days per week. As an advanced lifter this should be sufficient. Some of the top physique competitors use three or four day a week crash programs. These kinds of programs are not designed for the average trainee or to be used for any extended period of time. If you are thinking of following one of these programs, make sure that you are ready for it. I guarantee that if you work hard enough, two days per week will be sufficient. What I will attempt to do is list several types of leg routines and the benefits of each. 1) The standard 5 x 5 pyramid routine is as good as any. If you put in the effort, this routine will supply the results. 2)An individual wanting to lose weight and/or improve his cardiovascular system might use a high rep program. Every time you go through this routine you should strive to complete it in less time. 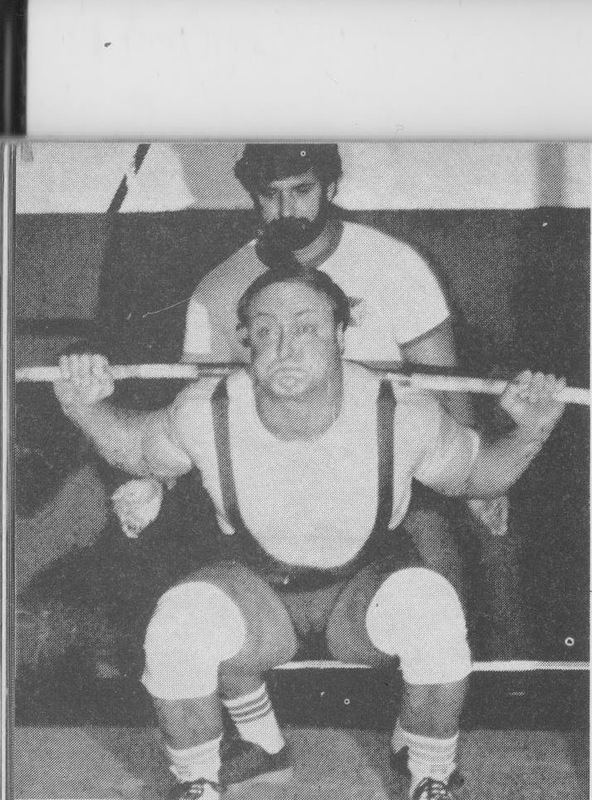 3) This program is for the individual who truly cannot squat. it may also be used as an occasional change of pace workout. Not everyone can or wants to squat 12 months per year. 5 x 8-10, adding weight on each set. On all of the above add weight as often as possible. Again, the key is to go all out. Since you are using the largest muscles in the body, you can normally squeeze out another rep if you have to. These are just sample routines. Since we are all individuals our requirements from our training differ. Feel free to follow one of these programs or to devise on of your own. The following list and description of exercises may be incorporated into your leg program. Wide squats work the inner thigh muscles. A close stance squatter could benefit from wide squats by developing power throughout the entire thigh muscle. Overall development will benefit from different foot spacings. Use 4 to 8 reps.
A good movement for the wide squatter to increase starting power out of the bottom position. Close squats isolate the thigh more than the wide squat. Good all-around leg development means a better squat no matter what style of squatting your use. Use 4 to 8 reps.
Works the same muscles as close stance squats, only in a more direct and intense way. The front squat totally isolates the thighs. Any assistance from the hips and back is negated by the almost straight and upright position of the back during this lift. Front squats are difficult to do. They require good balance and a high tolerance for pain in the thighs. A great exercise once you get the hang of it. Use medium reps of 4 to 8. A favorite exercise of George Frenn, and no doubt one of the reasons for his great squatting power. Box squats can be done with boxes or benches of different heights. Touch-and-go or dead stop can be used. Box squats isolate the thighs when they are done with a close stance. High repetition with very heavy weight is one of many ways bench squats come into their own. The advantage of bench squats over other thigh exercises is a poundage equal to or more than the lifter's maximum single can be used for high reps through a full range of movement. Heavy weights and high reps. This is a very good exercise. Can be used as a thigh isolating exercise. Foot spacing can be varied to work different parts of the thigh. One advantage of the leg press is the back can be rested while the legs handle heavy weight for reps. 8 to 10 works best. The most popular and widely used squat assistance work. The pins are set at any position, so the lift can be done from any sticking point to lockout. Allows one to work the weak points of his squat. Use low reps - 3 to 5 reps.
Isometric squat work is done on the power rack. The lifter adjusts the bar to the same level the sticking point is encountered and pushes against the immovable bar. Do only two sets of 10-second pushes. Do not hold your breath for the entire 10 seconds, or you may rupture a blood vessel. This was a favorite exercise of Jim Williams. Recommended reps are 2 sets of 10 seconds. 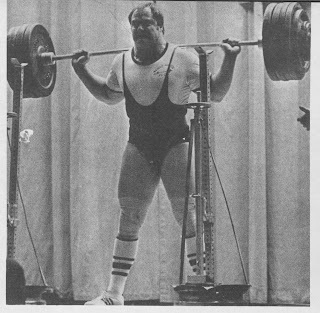 The pause squat can be done wide stance or close stance, depending on the lifter's own style. Pause squats are an effective at increasing strength because theyh force the lifter to handle weights without the benefit of a bounce or muscle rebound out of the bottom. Pause squats should be done after your regular squats once a week. You must decide if the exercise is for you. Use 4 to 8 reps.
Two very good exercises for increasing strength and muscularity of the thighs. Weights handled in the leg extension and leg curl are not the poundages one would think of as squat assistance work poundages. The poundages are low compared to other squat assistance exercises. Benefits of the leg curl and extension are mainly a stronger, more stable knee joint. Use good form and 10 to 12 reps.
Give leg work an honest effort. I am sure the results will both surprise and please you.